When Spanish castaway, Cabeza de Vaca, arrived in Mexico City after his escape from slavery and epic, eight-year journey across the interior of Texas and Northern Mexico, he met with the Viceroy of New Spain, Antonio de Mendoza. During the meeting with Mendoza, De Vaca described his stay with the Jumano, a tribe of Native Americans who lived west of the Big Bend area along the Rio Grande. According to De Vaca, the Jumano told him of seven fabulous cities of gold, known in Spanish legend as Cibola, that lay somewhere to the north of their land. Spanish conquistadors had already discovered yet uncounted riches among the Native Americans of Mexico and Peru. Could the tale of the seven cities of gold also be true? Before he risked the expense of outfitting a full scale expedition, Viceroy Mendoza wisely decided to dispatch Friar Marcos de Niza and Estavancio, a former Moorish slave and survivor of Cabeza de Vaca’s journey, north to confirm the existence of the legendary Cibola. After the small expedition reached the area of present-day Arizona, Friar Marcos sent Estavancio ahead to scout into the land of the Zuni. The former slave’s instructions were to send a runner back with a large cross if he found Cibola and a small cross if the story proved to be untrue. Several days later a runner returned bearing a large cross. Friar Marcos hurried north to join Estavancio; however, as he neared the land of the Zuni, he learned that the suspicious Native Americans killed the former slave. In the far distance, the Friar saw the sun reflecting on a Zuni pueblo, which he mistook for the glint of gold. Fearing for his life if he approached any nearer, Marcos returned to Mexico City. There the Friar claimed that although he had not set foot in Cibola, he had seen a golden city standing high on a hill and the Pacific Ocean off to the west. Based on the report of Friar Marcos, Viceroy Mendoza commissioned Francisco Vasquez de Coronado, the governor of the province of Nueva Galicia, to lead an expedition in search of Cibola. Coronado’s expedition, including 250 cavalry, 80 infantry, 1000 Indians, several priests, and thousands of horses, cattle, and sheep, departed from Culiacan, the capital of Nueva Galicia, in the spring of 1540. Moving ahead of the main body of the expedition with a small advance force, Coronado reached the Zuni pueblo of Hawikuh, in July. Though he arrived with peaceful intentions, fighting broke out almost immediately. The Spanish, equipped with muskets, armor, and horses, easily defeated the Zuni and moved into the pueblo. An expedition sent north to deal with the pueblos of the Hopi was equally successful, but neither the Zuni nor the Hopi possessed the precious metals or gems Coronado was searching for. Thus, while the Spanish had little trouble dealing with the military aspect of the expedition, the economic results of the campaign were disappointing. The main body of the expedition arrived soon after the problems with the Zuni and Hopi were settled, and Coronado decided to winter in the Tiwa village of Tiguex, located in the Rio Grande valley, not far from present-day Albuquerque. In the beginning, relations with the natives were friendly, but before long, pressures on the food supply, brought on by the unexpected Spanish occupation, and several sexual assaults on Native American women antagonized the Tiwa and led them to launch an attack. Believing that it was necessary to crush the Tiwa as an example to discourage the aggression of other tribes, Coronado retaliated without mercy. He sacked the biggest Tiwa settlement, burning thirty Native Americans at the stake, and then captured the large and well-defended pueblo of Moho in March 1541. After the decisive victory, the survivors of the attack were enslaved and distributed among his men as tribute. Refusing to return to Mexico City empty-handed, Francisco Coronado split up his expedition. The conquistador sent one group west to search far across the present-day state of New Mexico and into Arizona. 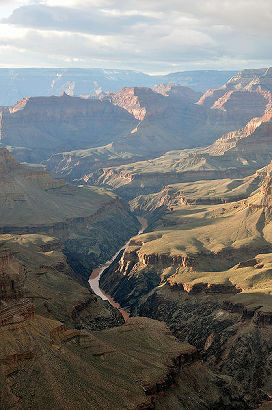 They became the first Europeans to view the majestic Grand Canyon. On April 23, 1541, Coronado led another group east, based on the advice of an Eastern Plains Native American the Spaniards called “El Turco,” or the Turk. The Turk promised to lead the expedition to a golden land the Native Americans referred to as Quivera. He first led the expedition onto a vast and featureless steppe the Spaniards named the Llano Estacado, or Staked Plain, passing through the present-day Texas towns of Hereford and Canadian. The Spanish were amazed at the number of buffalo that inhabited the plains. In his report to King Carlos, Coronado said “After nine day’s march I reached some plains, so vast that I did not find their limit anywhere that I went, although I traveled … for more than 300 leagues and found such a quantity of cows … that it is impossible to number them …” The Spanish encountered a tribe of Native Americans on the plains they called the Querechos, nomads who survived by following the huge buffalo herds. Most authorities agree the Querechos were the Apache. 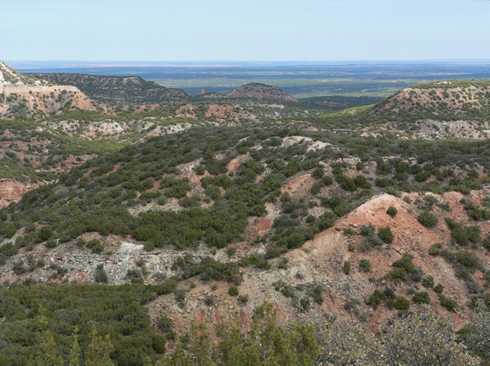 Continuing to follow El Turco to the southeast, the expedition dropped off the table top of the Llano Estacado and entered the canyon country of the Caprock. 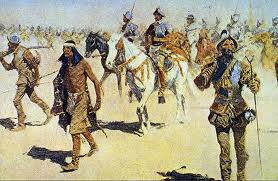 There the Spaniards met with another group of Native Americans, the Teyas, who were enemies of the Querechos. Like the Querechos, the Teyas were also numerous and survived by hunting the buffalo, but the canyons they inhabited had trees and flowing streams, and they could freely forage for roots, nuts, and berries. Authorities vary as to which historical Native American group the Teyas belonged, but most believe they were related to the Wichita. While in the canyon country, the expedition was struck by a violent Texas thunderstorm complete with high winds and hail stones that shattered pottery, shredded tents, and wounded many of the horses. When the Teyas learned Coronado was searching for Quivera, they informed him he was going in the wrong direction. Quivera, they said, lay much further to the north. 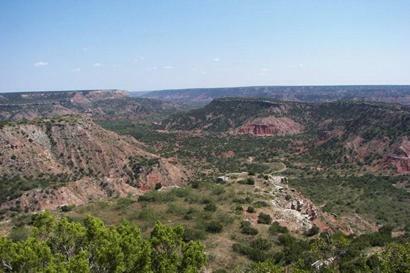 Following their advice, the expedition eventually reached Palo Duro Canyon, near present-day Amarillo. By this time, Coronado began to suspect the Turk was not telling the truth, so he ordered most of his men back to Tiguex and continued his journey as a reconnaissance rather than a mission of conquest, with only forty soldiers and priests, and an unknown number of Native American warriors, servants, and guides. Thirty days later, the smaller force struck what is today the Arkansas River, probably a few miles east of present-day Dodge City, Kansas. Coronado followed the Arkansas northeast for three days until he met a buffalo hunting party from Quivera, but when the friendly Native Americans took him to their villages his worst fears were confirmed. Instead of golden cities, the Spanish conquistador found only straw-thatched dwellings and ripening fields of corn, beans, and squash. Coronado spent more than three weeks in Quivera, questioning the Native Americans about the existence of richer kingdoms, but his efforts were in vain. Severely disappointed with the outcome of his search, he ordered the Turk garroted for lying and returned to New Mexico. After wintering once again in the Rio Grande valley, Coronado led his men back to Mexico in 1542. Upon his return, he faced charges of having violated the New Laws concerning Native Americans by abusing them and confiscating their property. The conquistador was eventually cleared of these charges, but he lost his position as governor of Nueva Galicia in 1544 and was forced into bankruptcy. 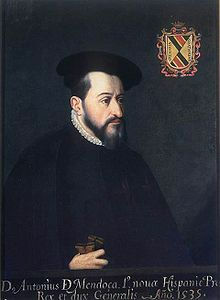 Coronado retired to Mexico City, where he died on July 21, 1554. Though unsuccessful, Francisco Coronado’s search for the fabled Cibola had far reaching consequences for the both the Spanish and the Pueblo Indians. The expedition demonstrated to the Pueblos that the Spanish were capable of retaliating in a vicious manner for any transgression, and, more importantly, that the Europeans enjoyed a decided military advantage due to their horses, firearms, and metal weapons and armor. For the Spanish, Coronado’s wandering search of the Southwest, coupled with Hernando de Soto’s nearly simultaneous unsuccessful search of the Southeast, put an end to the belief that the North American continent contained a rich and easily plundered Native American civilization like the Aztecs or the Incas. As a result, Spain lost interest in the region for nearly sixty years, until the French exploration of Eastern Texas led by Rene-Robert de La Salle convinced the Spanish to send Juan de Onate to establish the New Mexico colony of Santa Fe in 1598.